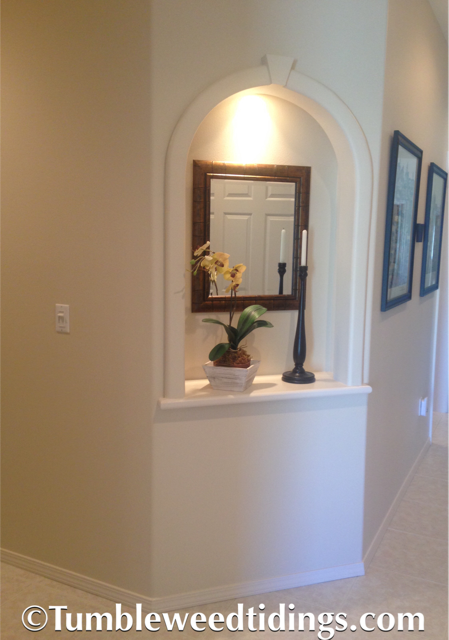 We have a small niche in our hallway that sits on an angle on the corner leading into our master bedroom. I usually walk past it ten or more times a day. I should notice it, but you know. 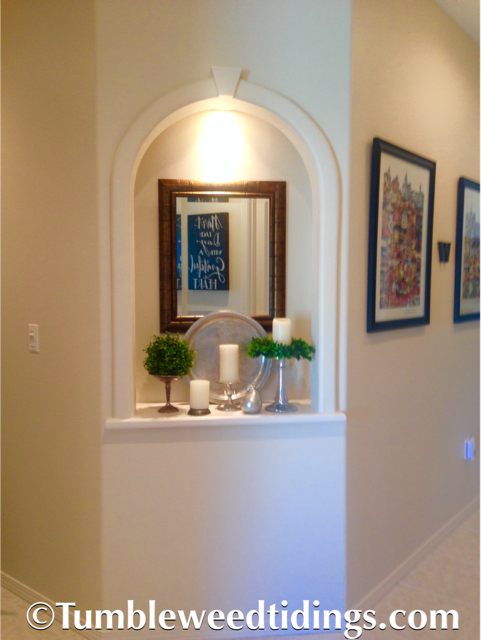 The niche is also on the main hallway that most of our guests and family members use when they come to our side door, and it is the first thing you see when you enter the hallway from the garage. It even has a light on a dimmer that you can use to create all kinds of ambience. You’d think with its features and exposure, it would be a pretty important décor opportunity in our home, right? Well, not so much. Each year when doing Christmas decorating, I install some deer, pinecones, candles, a JOY sign and greenery to amp it up for the holidays. The rest of the year, for most of the nine plus years we’ve lived here, it looks like this…..
Not necessarily bad, but I recently took notice of this neglected niche and thought it might not be living up to its full potential. In the niche universe, that is. First, I experimented with a silver scheme, using some new-to-me candle holders I recently purchased at a consignment shop in Sandpoint Idaho. The total cost for the three holders, you ask? Only nine dollars! I mean if they’re going to practically give these things away, I’m in. 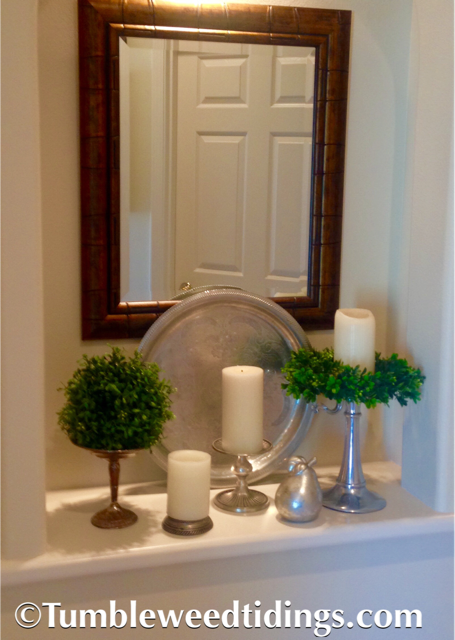 Adding a silver tray, a footed sterling compote dish, candles and greenery I already owned, brings this makeover in at $9. The second option I tried for the niche makeover was in a pallet of blue and creamy white, with a hit of green. If we are going to be friends, you should probably know that I love blue and white pieces and have them in all shapes and sizes. Our daily use dishes are white with a blue rim. Blue is my favorite color. Blue and cream have been used in our bedroom for our entire marriage, in differing shades, but always with the serenity of blue. If it wouldn’t mean redoing our entire home, I would surround myself with various shades of this color that always remind me of the water and sky. Okay, I digress, so back to the blue and white niche. 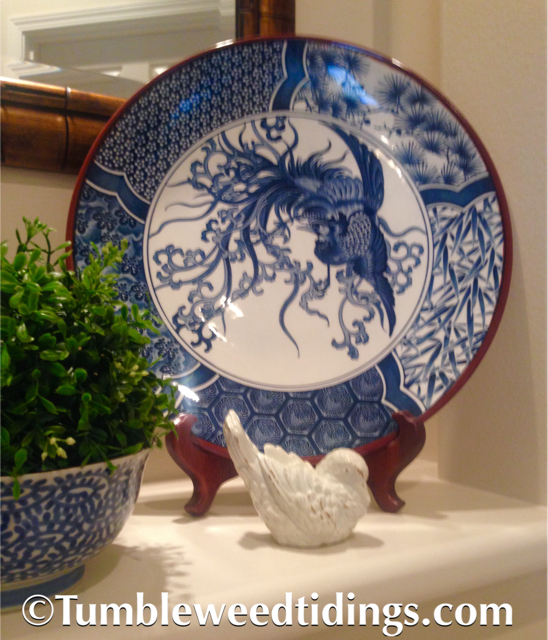 A large blue Asian plate with a bird on it, a blue and white vase, some books, a bowl with some greenery and a sweet little white bird complete this look. Cost for this niche makeover was $0. 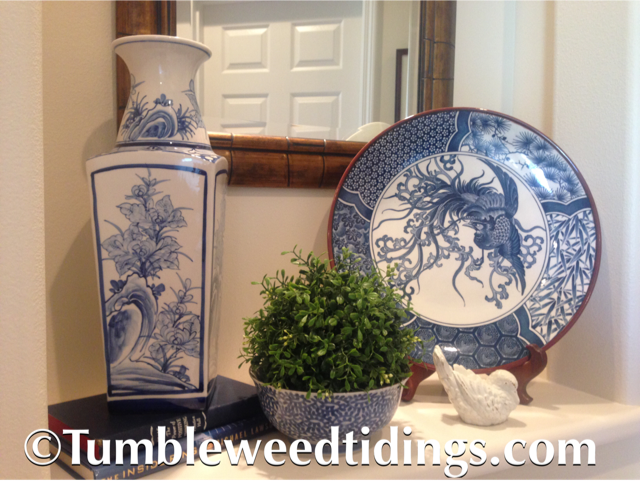 I like them both, but for now, I’m loving the blue and white vignette. It just feels light and bright for summer, and the large plate was a gift from my husband while were dating, so it will be nice to have it in a location where it will get appreciated. I hope I have inspired you to look around your space and think about how rearranging small things can have a big impact on your style. 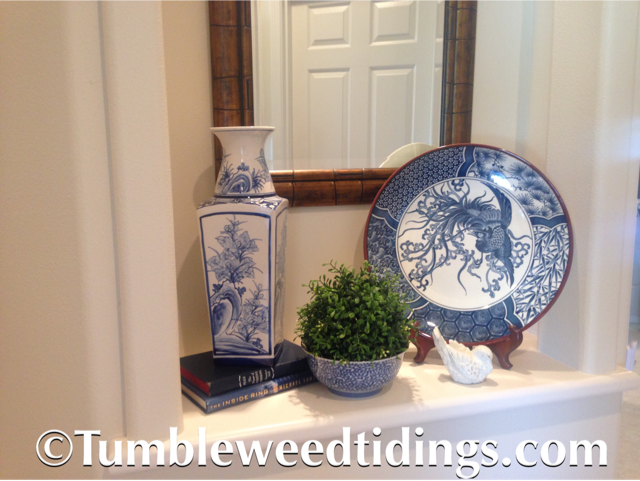 It is easy to fall into a rut and have areas in our homes that get forgotten or neglected. And while I am certainly not suggesting that we should run around moving our furnishings every few days, sometimes change is good. It tricks us into thinking we have a new look, not unlike adding a different scarf or necklace to an old outfit. It feels fresh and current. 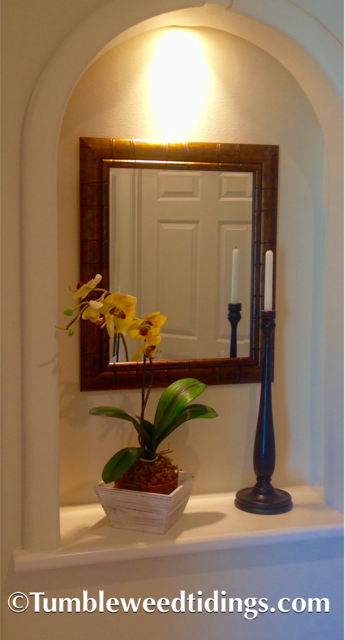 I challenge you to start thinking about ways to hit the reset button on your stale décor. Bring out grandmas vase, put a favorite plate on an easel, frame your children or mother’s artwork, cut some flowers or branches from the yard and put them in an old bottle, or move a chair from one room to another. When you discover that you are able to incorporate items you already have, reimagined and repurposed in a new way, it will feel so rewarding, you’ll never want to stop. I promise. I love all the possible looks for a sometime difficult space. Funny how we walk by hundreds of times, not really “seeing.” Life and house niches: clear them off; get a little kooky, and experiment with previously un-thought-of things. 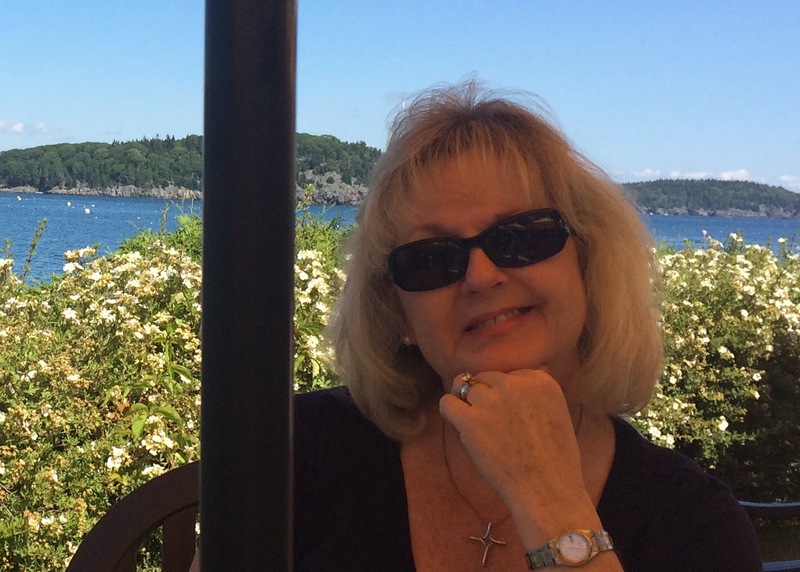 Diane, your blog is illuminating and fun! So true! We recently had most of our interior rooms painted and I really had to force myself not to re-hang everything in the exact same place! Where did you find the silver pear? Your so Clever, I have some niches but they are not eye level, I do have stuff on them but a bear to dust! This is so interesting. I just loved reading it. The blue arrangement is my favorite. Everyone seems to like the blue and white. It is the one I’ve left there for summer. Thank you!